No one wants to hear the word eviction in conjunction with their own rental property. It usually means there have been ongoing issues with residents and it is time to take the next step to get your property back. The eviction process is scary and filled with hard to understand legal jargon and formality. Your local Real Property Management team has the experience and training to ensure you are abiding by state and local laws, giving you the peace of mind you deserve. Here’s a little test of your own knowledge of the eviction process. Question: What must be included on an eviction notice in every state? Answer: D. None of the above. The laws for serving eviction notices vary widely from state to state. Fortunately, your local Real Property Management office is well versed in the specific laws where your rental property is located. You can be assured that they will handle your eviction properly and professionally, saving you costly legal fees and overages from the process being mishandled. Another great reason to entrust your property with the professionals. 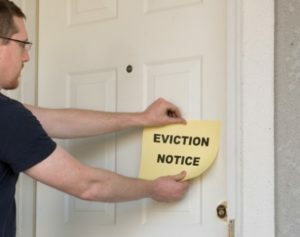 Contact RPM Pittsburgh today and ask us about our eviction protection plan!